This is a sponsored post written by me on behalf of Sterling for IZEA. All opinions are 100% mine. So by now you know that things are often a zoo around our house. Between the two older kids, the three little boys, the dog and a husband who might be the biggest dirt magnet of them all, it seems like someone is always in the bath or the shower. Thankfully, my husband and the two older kids don’t need supervision when they are getting clean, but the dog and toddlers are a different story. If you have a tub with a sliding glass door, you probably have a love hate relationship with it. You love it because it does a lot better job of keeping water where it belongs (hint: that’s in the tub, dear toddlers) rather than all over the laminate flooring you rashly put in the bathroom. You hate it because kneeling or leaning on a hard door track is pretty painful. The great people Sterling have a solution for that – the Prevail shower door has ComforTrack technology. That’s a bottom track that is cushioned and flexible and thus, a lot less painful to lean or kneel on when you’re fighting with a two year old who’s decided he doesn’t like baths today. While it is flexible, it is no less durable than a rigid track, meaning that even if your shower sees the traffic that ours does, it will take whatever you can dish out. The ComforTrack technology also features a low profile and sleek shape that is easy to keep clean. With a busy house and a busy life I love anything that makes cleaning easier! The Prevail Shower Door by Sterling is available for BOTH bath and shower doors. The Prevail Shower Door is great for bathing the kids, pets, or relaxing in the bath with your feet up (does this happen in real life? ), all the things that aren’t so comfortable or easy with a hard shower track. 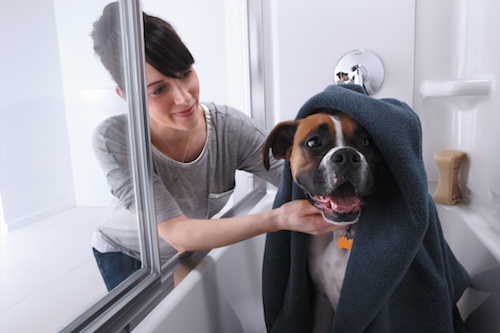 It’s a smart addition to any showering space! What is your bath time routine? 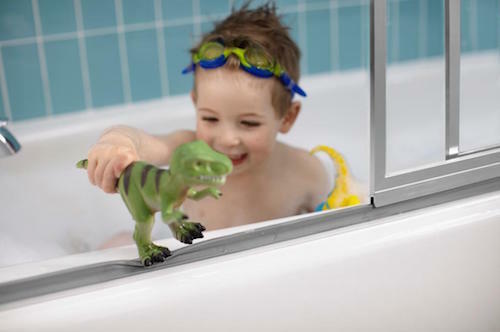 Do you have toddlers to help in the bath or pets to get clean?